Join Dan and Tanya for an 11-day voyage in Norway’s archipelago! The MV Polaris I is ideal for small group expeditions to discover remote locations in the great north that are inaccessible to the larger cruise ships. Polar bears create an unforgettable spectacle whether hunting seals on pack ice, shepherding cubs along the beach, or swimming near our Zodiacs. High above the Arctic Circle, we’ll explore deep fjords, polar deserts, tundra tinged with wildflowers, and vast glaciers calving into the sea. Summer in the Arctic! On foot and by Zodiac, we’ll be on the lookout for walrus, Arctic fox, and reindeer, and revel in millions of migratory birds, including little auks, guillemots, and puffin. The seas are alive with whales along with bearded and possibly ringed seals. What makes this tour special is that it will have a “flexible” schedule, meaning if we find polar bears we can stay with them to maximize photography opportunities. Travel with a small group (12 guests maximum!) on a very comfortable and welcoming boat and go off the beaten path to remote locations that the 100-500 passenger cruise ships cannot travel to. As with all wildlife, polar bears are not guaranteed. This trip is weather and ice dependent. Each year is different. This is a great opportunity for anyone who has always wanted to visit this region of the world. Arrive in Longyearbyen, Norway (flight suggestion TBA). Transfer to the MV Polaris I, board the ship, and head north to begin our 11-day, 10-night polar expedition! We will suggest SAS flights closer to trip time for everyone to book. Please book the suggested domestic flights to ensure you remain with the group for transfers. 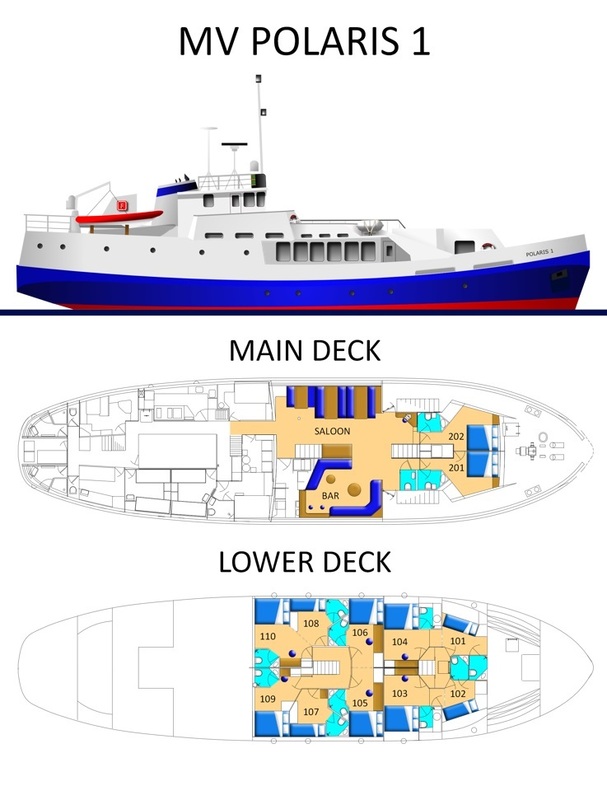 MV Polaris I – See Accommodations for full ship details. Spitsbergen is the largest island in the Svalbard archipelago in the Arctic Ocean, north of Norway. Very mountainous, the island of Spitsbergen (which means ‘pointed mountain’), presents all the characteristics of the polar environment. It offers stunning panoramas, gigantic glaciers plunging into the sea, steep mountains, and also flowering plains and welcoming tundras. It is home to a very diverse arctic fauna: polar bears, bearded seals, walruses, reindeer, polar foxes, whales (belugas and minke), as well as many birds such as common eiders, Arctic terns, puffins , Guillemots, mergules, bunches, geese, ivory gulls, and phalaropes. Every day we will be in a different place, sailing along the coast with many stops to the north of the island. Apart from the first and last day, our sailings will consist of zodiac landings of a few hours—sometimes lengthened by encounters with bears, whales, or seals. We will spend our nights anchored at the foot of the glaciers or in beautiful, peaceful bays. As we are a French ship, of course we attach a very high importance to the food, and our chief cook is a very good chef. We also have a good selection of French Wines onboard. All of the crew has been sailing on Polaris for many years, and they are all enthusiastic and very involved in the activity, always trying to make the guests happy and always ready to talk with them. We have an open bridge with seats for guests, so it’s always a pleasure to share our experience with them. The outside deck is absolutely perfect for wildlife sighting with a large sundeck. The restaurant and lounge/bar have large heated panoramic windows. The embarkation in the two zodiacs is done thanks to small stairs and a pad—very easy and safe, even for older guests. June trips are perfect for sea ice—which is close from the island at this time of the year—and we can have very good opportunities to watch wildlife on the ice such as seals, walrus, and polar bears. When it comes to polar bears, of course it’s unpredictable, but we have very good chances to see several bears, sometimes very close from the zodiacs. The usual routings we do are the Northwest coast, Ice Edge, Hinlopen, and Nordauslandet, seven Islands and back. Of course everything depends on the weather, ice conditions, and wildlife! We sometimes change plans several times per day, when we meet a bear, a whale… We are a member of AECO and keep in touch with some other ships happy to cooperate for sharing information about wildlife. And because we are a small ship, we do not have to establish precise sailing plans in advance. We have guides with a lot of experience onboard Polaris in Svalbard with good skills for driving zodiacs and also good for scouting polar bears. Good bears spotters are the keys to success if the main purpose of the trip is finding polar bears. Regarding sailing in the ice: when we sail to the ice edge, we follow the edge most of the time looking for bears. Following the edge is the best option because we keep a good speed and we can scout huge areas with the scope. Of course sailing to the ice requires calm weather and good visibility; otherwise it’s really a waste of time. We can push ice with the ship and sail into 5 to 7/10 sea ice. This allows us to get close to the orange and red ice which are the most interesting to find polar bears. But we can’t “break” ice; there are no small ships able to do so. Even the big ships in Spitsbergen stay along the edge, except Ortelius which is the only one designed as an icebreaker. When it comes to overnight on the ice, we can do it when the conditions are good or when we want to stay close to a bear with a carcass for example, this is possible. We can either stay adrift or moor on a big ice floe if we find a good one; it depends on the winds, tidal stream, ice around, etc. If we consider that there is any risk for the safety, we prefer sailing away and coming back in the morning. One other important thing about sea-ice: people are always very excited when sailing to pack ice, both for the beauty of the ice itself and the good chances to see walrus and seals on the ice and also because they believe that there are better chances to see polar bears on the ice. This last point is not really true unfortunately. If we see polar bears on the ice, it’s most of the time quite far from the ship, and it’s not at every trip that we have curious bears approaching us. We usually find more bears on land which are easier to approach, or on the ice in the fjords. In June many fjords are still frozen and this can give good opportunities. But, as usual, we never know what we’ll see, and this is why it’s so interesting. We have been to Svalbard with groups on very small boats and a mid-size ship; there are positives and negatives to both options. Dan and I believe—based on our experience—that chartering our own boat that is a good size with many staff is the way to go. We can adjust the schedule during our journey based on what we encounter and where. We will have access to some areas large ships cannot explore. Remember, June in Svalbard is land of the midnight sun, long days to look for bears. Our goal is to search for bears, and it would be nice to find some walrus and whales along the way too. We do not plan to have this trip as a “see all Svalbard has to offer” type of tour. We want a group that is willing to put in the time to look for bears and understand that finding bears is not always easy. We will base our decisions on the captain’s experience, his contact with other ships, weather, and ice conditions. Our goal is to try to find polar bears and get some great photo opportunities. Disembark the MV Polaris I for our return flight home. Please book domestic flights as shown in the Flights To Book section to ensure you remain with the group for transfers. SCROLL DOWN TO SEE GALLERIES FROM EXPLORERS ON PAST SVALBARD TRIPS. Please Note: Charter rates are based on the Euro. If the US/Euro exchange rate drastically changes between now and then, we may have to adjust rates for any currency influx. We are booking three years out! Book your international flights to and from Oslo, Norway (OSL). We will recommend Oslo-Longyearbyen flights closer to trip departure. The MV Polaris I is ideal for small group expeditions to remote locations that are inaccessible to the larger cruise ships. Originally a support ship of the British Royal Navy, the MV Polaris I was completely transformed into a comfortable luxury ship in 2007. It is built of very high quality steel and designed to navigate any type of sea, a solid and reliable boat. Its robustness and comfort make it a perfect vessel for safe navigation in polar regions for those wishing to travel off the beaten track while enjoying optimal comfort. The ship flies the French flag and is followed by the classification society Det Norsk Veritas, world-renowned as one of the most serious in the maritime field, thus ensuring the highest safety standards on board. The Polaris is an authentic and a very comfortable floating shelter where safety, well-being, comfort, and relaxation of the passengers are the masters. The main deck consists of a roomy dining area, bar, and lounge with large panoramic picture windows, allowing guests to enjoy breathtaking views while they dine or relax at the bar. The lower accommodation is made up of 12 cabins, 4 singles and 8 doubles. Each cabin has its own private shower room, toilet, and port hole/window. No bunks! Closer to trip time, a list of camera gear suggestions will be sent to each guest along with a “goodie box” to get you prepared for the trip. Daniel will also call you to say hello and answer any camera gear questions you may have. Everyone is welcome, regardless of skill or equipment! The majority of our guests are amateur enthusiasts who love traveling and taking pictures during their vacations. Our groups are non-competitive and friendly—we’re here to have fun! This trip is perfect for the guest who wants more than just a cruise. Daniel will work with each guest individually to help them advance their photography skills. Non-photographing spouses are always welcome! A visa is not required for stays under 90 days. Your passport should be valid for at least six months beyond your period of stay. Two empty pages are required for the entry stamp. You must be able to demonstrate sufficient funds and a return airline ticket. For the most up-to-date entry requirements for Norway, please visit the U.S. Bureau of Consular Affairs or Norway embassy websites. There are no vaccinations required to enter Norway. In summer the day is permanent; the sun shines at midnight. The temperatures can range between 32 and 59 °F. There is ample storage space in your cabin on the ship. Dan, Tanya, and eight crewmembers—captain, mate, AB, cadet, steward and chief cook, and two zodiac guides–onboard to take care of your needs. Be sure any medical evacuation insurance purchased includes evacuation in Arctic regions! Walking poles might be a good idea, especially if you have trouble walking over uneven ground. Some of the landings can be on slippery rocks or deep snow, and we may go for extended walks to see different parts of our landing point. Computers to download your digital images are not provided. We recommended you bring a laptop computer or similar downloading device to download your images. The electrical supply onboard MV Polaris I is 220-volt. You will need a European round two-prong plug adapter. There is no GSM/3G coverage outside Longyearbyen, so there is no Internet onboard the ship. However, there will be a satellite telephone onboard the ship that can be used for emergency contact only. The chefs will take your dietary requirements into their meal planning and ensure you receive tasty, healthy meals. Please ensure you list any dietary requirements on your photo tour sign-up form or email them to info@naturalexposures.com. You should be in good general health and be able to walk reasonable distances, sometimes over uneven terrain. However, if you have problems walking on rough ground, you can enjoy the scenery closer to shore. Please notify us if you have any physical limitations. Seasickness depends on the individual. Typically a small percentage of people get seasick on any trip and most of these people are fine after a day or two at sea. If you’re particularly susceptible to seasickness, then it’s a good idea to talk to your doctor before trip time. Bring motion sickness tablets. As with all wild animals, we cannot guarantee you will see polar bears. However, the time of year we visit is when bear numbers are at their peak, and the experienced leaders and crew are aware of the bear’s habitats and are well trained to spot these marvelous creatures in the wild. "If you ever want to travel to another country and you want to go first class, travel with Natural Exposures. They are number one in showing their guests the best time ever in the classiest way. I would recommend Natural Exposures Tours to everyone. If you want to go in style, go with NE!"